Regular monthly meeting are the first Tuesday of each Month at 8:00 p.m. sharp. Regular Directors meeting are the third Tuesday of each month at 8:00 p.m. sharp. Please be aware that membership is currently closed. Any interested applicants should complete the club membership application found at the bottom of this page and submit it to the club. Applicants will be placed on a waiting list in the order they are received. 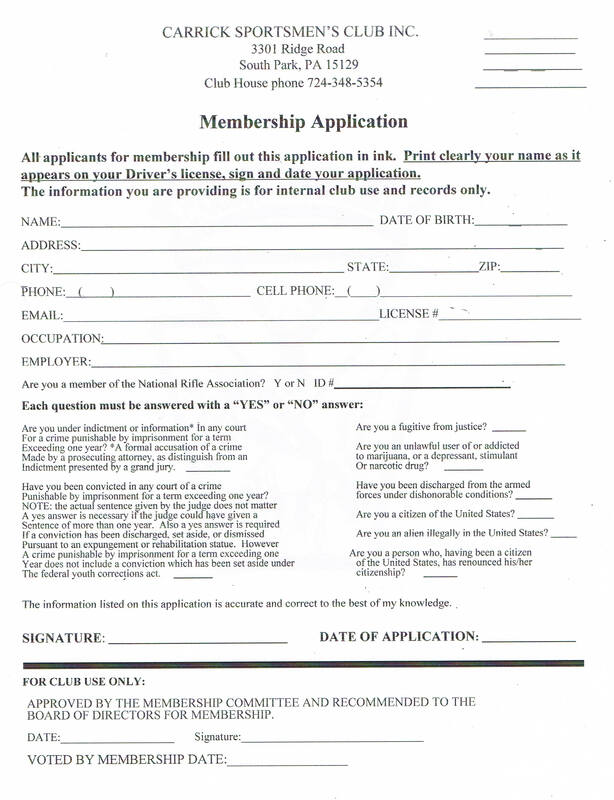 All new applications will be accepted from new members for use of the indoor range only! There will be NO outdoor range access at this time; therefore, this will NOT be a full privilege membership. There is a one time $50 initiation fee for all new members. The new dues are now in effect. Yearly membership fees now total $90. There are reasonable fees for certain organized shooting activities including trap, pistol leagues and junior leagues; however, we do not charge additional range fees for use of the ranges by members. This includes immediate family members residing in the members residence. Associate member (spouse) residence same as member $20. Associate member initiation fee $15.00. Active military membership for those already a senior member is $0.00. Each member is requested to participate in selling lottery calendars, 2 times per year, to cover operating costs and provide funding for equipment and remodeling. There are training requirements before access to all shooting ranges will be released. Front gate and club entrances electronic access cards will be released once training is completed. Additional training is required to access outdoor ranges or have guests accompany a member. In an attempt to keep the club an enjoyable experience and, most importantly, keep up with safety measures, the club holds voluntary work parties every third Saturday of each month. Typically work parties consist of grounds cleanup / maintenance, minor remodeling and shooting range cleanup / maintenance. Any memeber who is on active duty service and held a current membership when they are deployed will be carried forward for no charge till they muster out. Paul Joos, 1316 Creedmoor Avenue, Pittsburgh, PA 15226. Make your check payable to the Carrick Sportsmen’s Club.